Too often we get caught up in the day-to-day tensions that arise between our co-workers or fellow students. Although we ourselves may remain mostly uninvolved in the conflicts that come about through the normal discourse of our activities, the animosities and disputes between our colleagues can be distracting, and even harmful to the objectives of our workplace or classrooms. For this reason it can be helpful for all of us to have at hand some ideas and tactics to help alleviate issues that can arise from time to time – ideas and tactics that can help us maintain a pleasant working or study environment. Susan M. Heathfield offers some suggestions that may be of use in addressing these issues. 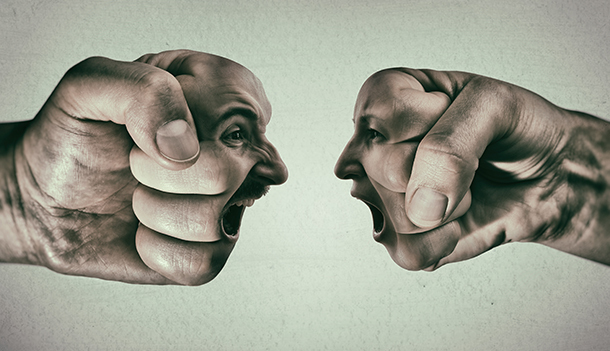 Don’t pretend the conflict will go away by itself – many times it will not. Even if it appears to disappear on its own, it can rear its ugly head again during times of stress. It is probably best not to try to speak with each participant in the conflict alone, since that person will most likely try to convince you of the correctness of their position. A better tactic would be to bring the warring parties together to try to sort out the issues. Non-involved co-workers or fellow students should be at hand to help with the discussion, since the stress of office or classroom conflict affects everyone, not just the conflicting parties themselves. Avoid allowing other members of your group to “take sides” in the discussion, since this may only encourage the involved parties to become entrenched in their own sense of correctness and/or offense. All witnesses should be as neutral as possible and offer only conciliatory suggestions. Ask the conflicting parties to briefly describe what they would like the other side(s) to do or say to resolve the situation. Ms. Heathfield states that three or four suggestions from each side will work well, but that the suggestions should be fairly concrete in nature, and not just a “rethinking” of one’s position or ideas. If this doesn’t work as well as intended, then ask each party directly what the other could do more of, less of, or stop completely. Try to get commitments from both or all sides to treat one another with dignity and respect, even though honest disagreements may continue to exist. Let both or all sides know that you have full faith and confidence in their capacities to resolve their disagreement(s) honestly and to resume their roles as fully productive and participating members of the group. It would be reasonable to assume that we can all agree on the benefits of a safe, respectful and harmonious workplace or classroom. To be fulfilling and consistent with our needs for growth and development, our work and study should be challenging and should contribute to the expansion of our horizons. However, the day-to-day challenges we face should not include distractions such as interpersonal conflicts, especially not if they culminate in a hostile environment that can only damage our overall scholastic, social, personal, and/or professional development. Ms. Heathfield’s suggestions are helpful in giving us a few ideas to shape our work and study environments, rather than becoming victims of them.